Now that the shilling's done, where was I? Ah, yes. Reviews! When it comes right down to it, this book's old-school sensibilities are amazing. Two issues in, and I remain stunned into only a few paragraphs of non-silence about the new kid on the block. At the risk of giving Messrs. Waid and Rivera a pair of swelled hornheads, this marks the first time I've truly enjoyed DD since the early days of Marvel Knights. Waid knows how to keep the wheels greased, starting off with an action scene between Daredevil and Cap that establishes the Man Without Fear's standing in the hero community. Then, he shifts effortlessly toward emphasis on supporting cast members new and old before Daredevil's superheroics dovetail with the ongoing legal plot. And then, things get weird. It all stays topical, DD stays jovial, and somehow it all feels fresh and urgent. 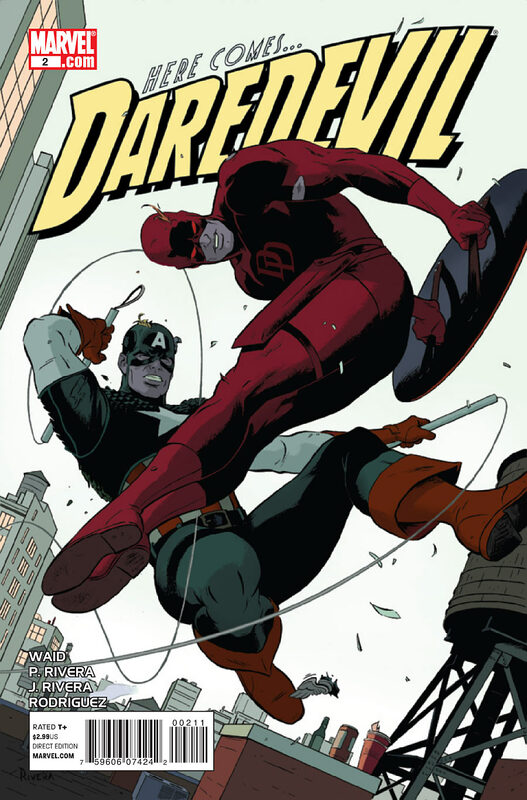 Just as Waid's attention to Daredevil's unique power set colors the entire narrative, it would all be for naught if Paolo Rivera didn't bring the goods. As in the previous issue, he effectively conveys DD's powers visually as few artists have. Moreover, every page is packed with pop-art power that uniquely echoes DD's earliest tales by John Romita Sr., Wally Wood, and Gene Colan. Rivera and his father give a great texture to the book, so kudos to them. I'll admit, I wasn't planning on picking up this new Daredevil series, but Mark Waid--and that stunning first cover--drew me right in. And then, as good as the first issue was, I wasn't going to pick up the second issue. I just can't stay away from the stories Waid's spinning, and the Riveras--well, they may be the best art team in comics. With two issues down, they're proving this book and its creators are the full package. You have to love the Silver Age whimsicality that writer Jeff Parker brings to the adventures of the Red Hulk month in and out. He always manages to combine the best classic aspects of comics with--as cliche as it is--a modern sensibility. 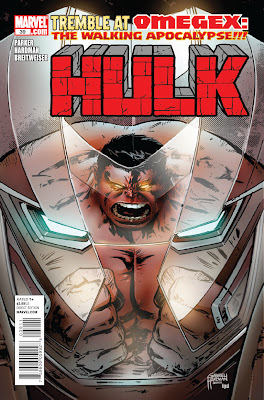 Hulk #39 is no different, and you can tell from that masthead proclaiming, "Tremble at Omegex: The Walking Apocalypse!" Believe me, it just gets better inside. As the first part in what seems the conclusion to a great many plot points raised in Parker's first issue--as well as artist Hardman's series finale--"The Stand-In" starts powerfully and doesn't let up. We see perhaps the earliest glimpse ever into Thad Ross' life, a day like any other interrupted by a personal tragedy--and interrupted again by an intriguing surprise: a certain crimson rampager apparently brought to the past. The story continues by giving us additional developments between Ross and his LMD companion Annie as they hide from General Fortean. Of course, the Walking Apocalypse must soon arrive, and everything hastily goes to hell in a handbasket, leading toward a conclusion that, in an unusual way, reminds the reader of a cliffhanger just two issues gone. I've mentioned Parker's smart script, but it bears mentioning that Gabriel Hardman ably holds up his end of the deal, demonstrating at once why he's been so sorely missed these last two-and-a-half months. His compositions are always engaging, from the early flashback sequence, on through quieter moments and finally the bombastic end run. Similarly, Bettie Breitweiser complements Hardman's artwork perfectly. I keep wondering if she'll stay on board when Hardman leaves following this arc. Honestly, together they're a tough act to follow. So, a year after Parker, Hardman and Breitweiser began working on Hulk, they're poised for the end run of this initial run of tales with the arrival of the Omegex. It's been an incredible ride, and honestly, I'm running out of good things to say about this team supreme and the work they do. With looks into the hero's past, and a rollickin' fight brewing, I can unequivocally state: Buy It. What say you, ladies and germs?